John Schmale will speak on the Ocean Shore Railroad at a benefit to restore the only remaining car from that historic line. Schmale has researched the Ocean Shore Railroad for 40 year and has a large collection of documents and artifacts. The mention of the Ocean Shore Railroad conjures different images for different folks. Many of the former employees that I had the pleasure of interviewing recalled an informal, friendly little railroad that provided vital services to the isolated coastside. The Ocean Shore brought the mail, express, and the first telephone service. For trainmen, it was a nightmare to run a railroad along the rugged coast. The entire line was closed for months at a time during severe winters. Many ex-employees related stories about how the 1906 Earthquake dealt a damaging blow to the fledging line and especially to its stockholders. Many lifetime friendships developed between the coastsiders and the Ocean Shore trainmen- even marriages. Most of the Towns in today’s Pacifica owe their existence to the hard-fighting, hard-luck railroad. Edgemar, Salada Beach, Brighton Beach, Vallemar, Rockaway, and San Pedro-Terrace by the Sea were important stops on the Ocean Shore Railway. In 1959 the towns were merged into Pacifica. Montara, Moss Beach, Princeton, El Granada and Miramar were laid out and planned by the organizers of the Ocean Shore Railway. The OSRR was a major factor in determining the coastal communities. Other folks seeing the modern, dwindling remnants of the Ocean Shore Railroad mostly ask, “Where did the tracks run?” It is not easy today to see evidence of the roadbed. Although several depots and a few trestle abutments remain most of the line is being paved over or reclaimed by Nature. Careful scouting of the route will reveal some chunks of the old roadbed. About the only real tangible remains of the notorious old line is the very real and wonderful Ocean Shore Railroad Passenger coach 1409. The car ran along the coast, between San Francisco and Tunitas Glen, during its salad days on the Ocean Shore line. Car 1409 was a 1909 product of the WL Holman Car Company of San Francisco. 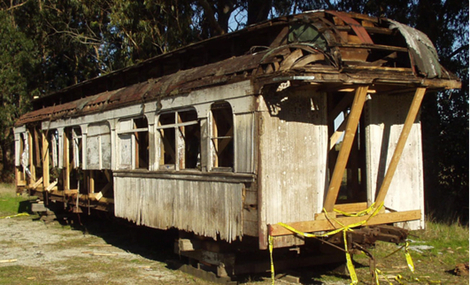 It is the only existing railroad car to have run along the coast.